This cross celebrates the rich sound of the many voices that make a joyful noise to the Lord. By combining the Bass and G Clefs a heart is formed. The heart of the choir are the harmonies and the various ways parts work together to create beautiful music. These clefs are fit over the top of a cross and glued to a medallion to make the fragile piece solid. 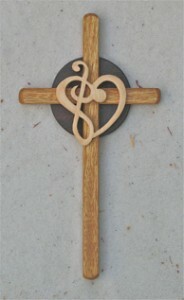 It is only fitting that the cross is made of Canary wood. Woods: maple, walnut, canary.